You can look at definition of support vectors and a few examples of its working here. Above, we got accustomed to the process of segregating the two classes with a hyper-plane. Now the burning question is “How can we identify the right hyper-plane?”. Don’t worry, it’s not as hard as you think! Identify the right hyper-plane (Scenario-1): Here, we have three hyper-planes (A, B and C). Now, identify the right hyper-plane to classify star and circle. You need to remember a thumb rule to identify the right hyper-plane: “Select the hyper-plane which segregates the two classes better”. In this scenario, hyper-plane “B” has excellently performed this job. Identify the right hyper-plane (Scenario-2): Here, we have three hyper-planes (A, B and C) and all are segregating the classes well. Now, How can we identify the right hyper-plane? Above, you can see that the margin for hyper-plane C is high as compared to both A and B. Hence, we name the right hyper-plane as C. Another lightning reason for selecting the hyper-plane with higher margin is robustness. 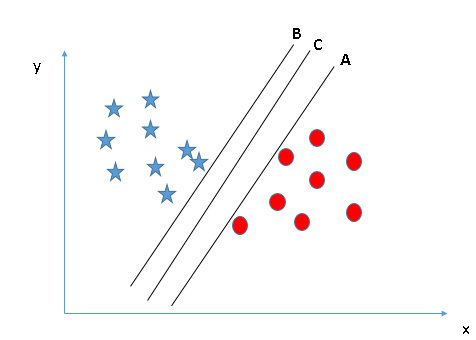 If we select a hyper-plane having low margin then there is high chance of miss-classification. Some of you may have selected the hyper-plane B as it has higher margin compared to A. But, here is the catch, SVM selects the hyper-plane which classifies the classes accurately prior to maximizing margin. Here, hyper-plane B has a classification error and A has classified all correctly. Therefore, the right hyper-plane is A. Can we classify two classes (Scenario-4)? : Below, I am unable to segregate the two classes using a straight line, as one of star lies in the territory of other(circle) class as an outlier. As I have already mentioned, one star at other end is like an outlier for star class. 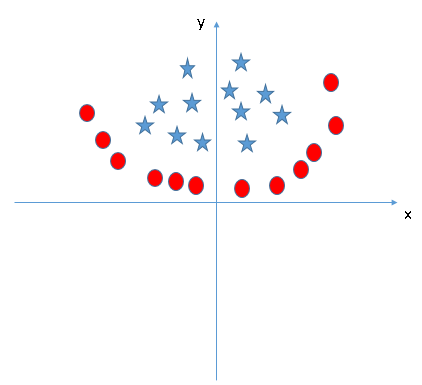 SVM has a feature to ignore outliers and find the hyper-plane that has maximum margin. Hence, we can say, SVM is robust to outliers. Find the hyper-plane to segregate to classes (Scenario-5): In the scenario below, we can’t have linear hyper-plane between the two classes, so how does SVM classify these two classes? Till now, we have only looked at the linear hyper-plane. 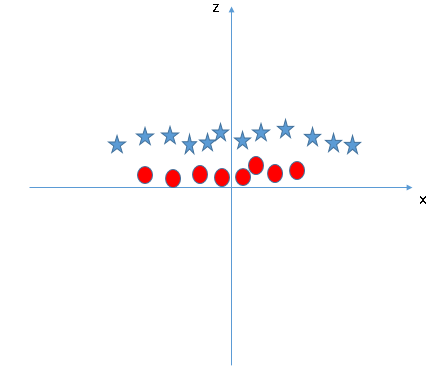 In the original plot, red circles appear close to the origin of x and y axes, leading to lower value of z and star relatively away from the origin result to higher value of z. In SVM, it is easy to have a linear hyper-plane between these two classes. But, another burning question which arises is, should we need to add this feature manually to have a hyper-plane. No, SVM has a technique called the kernel trick. These are functions which takes low dimensional input space and transform it to a higher dimensional space i.e. it converts not separable problem to separable problem, these functions are called kernels. It is mostly useful in non-linear separation problem. Simply put, it does some extremely complex data transformations, then find out the process to separate the data based on the labels or outputs you’ve defined. 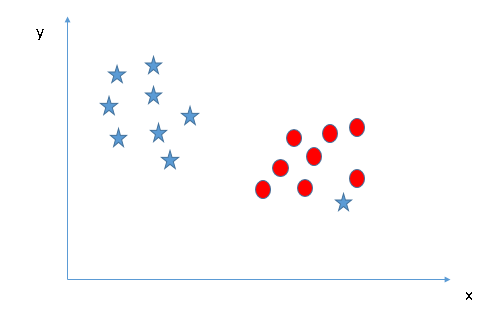 Now, let’s look at the methods to apply SVM algorithm in a data science challenge. How to implement SVM in Python and R? # there are various options associated with SVM training; like changing kernel, gamma and C value. How to tune Parameters of SVM? Tuning parameters value for machine learning algorithms effectively improves the model performance. Let’s look at the list of parameters available with SVM. sklearn.svm.SVC(C=1.0, kernel='rbf', degree=3, gamma=0.0, coef0=0.0, shrinking=True, probability=False,tol=0.001, cache_size=200, class_weight=None, verbose=False, max_iter=-1, random_state=None)I am going to discuss about some important parameters having higher impact on model performance, “kernel”, “gamma” and “C”. kernel: We have already discussed about it. Here, we have various options available with kernel like, “linear”, “rbf”,”poly” and others (default value is “rbf”). Here “rbf” and “poly” are useful for non-linear hyper-plane. Let’s look at the example, where we’ve used linear kernel on two feature of iris data set to classify their class. 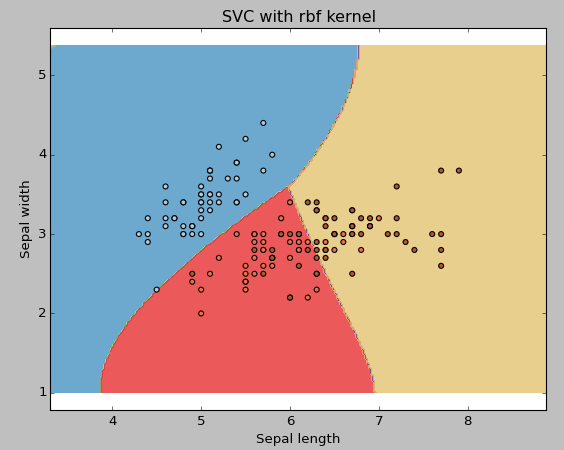 Change the kernel type to rbf in below line and look at the impact. I would suggest you to go for linear kernel if you have large number of features (>1000) because it is more likely that the data is linearly separable in high dimensional space. Also, you can RBF but do not forget to cross validate for its parameters as to avoid over-fitting. gamma: Kernel coefficient for ‘rbf’, ‘poly’ and ‘sigmoid’. Higher the value of gamma, will try to exact fit the as per training data set i.e. 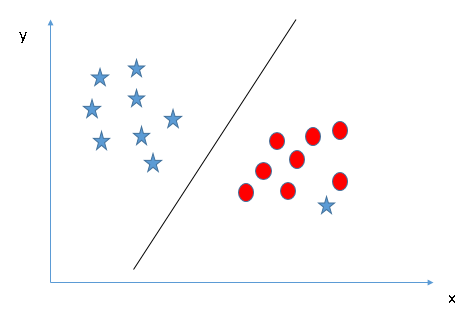 generalization error and cause over-fitting problem. Example: Let’s difference if we have gamma different gamma values like 0, 10 or 100. C: Penalty parameter C of the error term. 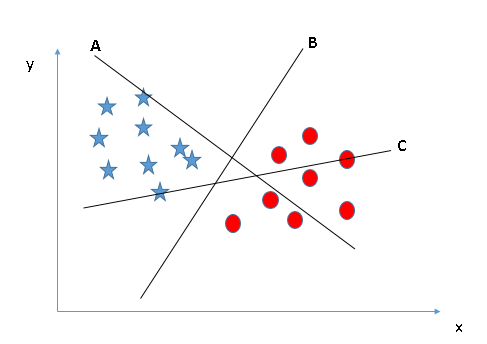 It also controls the trade off between smooth decision boundary and classifying the training points correctly. We should always look at the cross validation score to have effective combination of these parameters and avoid over-fitting. The kernel parameter can be tuned to take “Linear”,”Poly”,”rbf” etc. The gamma value can be tuned by setting the “Gamma” parameter. The C value in Python is tuned by the “Cost” parameter in R.
SVM doesn’t directly provide probability estimates, these are calculated using an expensive five-fold cross-validation. 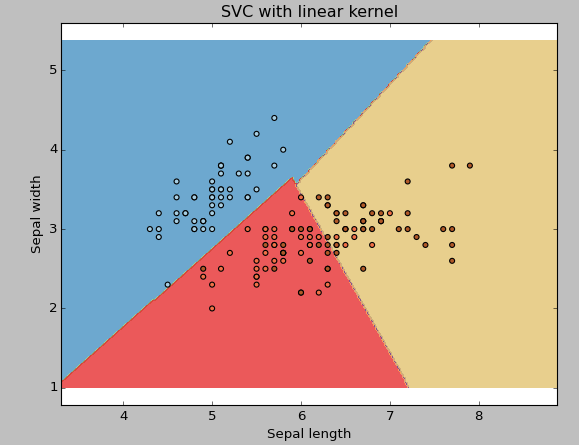 It is related SVC method of Python scikit-learn library. Answer the variable name in the comments section below. I’ll shall then reveal the answer. 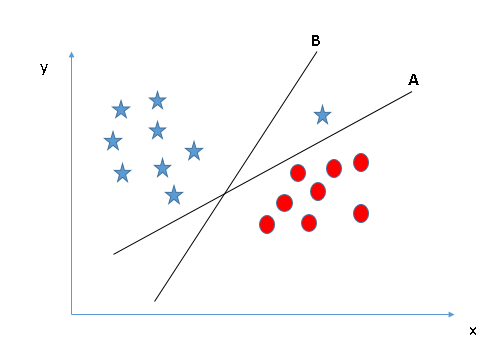 In this article, we looked at the machine learning algorithm, Support Vector Machine in detail. I discussed its concept of working, process of implementation in python, the tricks to make the model efficient by tuning its parameters, Pros and Cons, and finally a problem to solve. I would suggest you to use SVM and analyse the power of this model by tuning the parameters. I also want to hear your experience with SVM, how have you tuned parameters to avoid over-fitting and reduce the training time?